How It Will Change the Way We Communicate, Work, Travel, Transact and Manage Day to Day Life? Description of "Fifth Generation Mobile Technology (eBook)"
There are very few books available on emerging wireless technology like 5G. Most of the books are substantially lengthy and useful for audience who are software/telecom engineers, technical architects, telecom delivery managers. Also, there are few books which describe 5G Mobile technology in simple language at high level. This book attempts to bridge the gap between these two categories of books on the subject, and explains 5G mobile technology in an interesting manner keeping in mind all the readers, which are not necessarily having telecom background. At the same time, it explains 5G vision, use cases, business models, architecture and applications in simplified manner, so that layman reader will also have sufficient knowledge of this upcoming technology. This is book is useful for students, teachers, software/telecom professionals, delivery managers, and common people who want to know all important aspects of this exciting new technology. Gunesh has 23 years of Experience in the IT/Software industry and he is PMP certified professional, with excellent techno-managerial skills. Gunesh has a rare combination of management, technical and training skills. He has conducted large number of Java, PMP and Function point analysis trainings from his initial days in professional career. His meticulous approach, and detail analysis of problems has led to various path breaking world class solutions for his customers. Gunesh has worked as Senior System Consultant at Intelligent Systems Research Group of BT Laboratories in UK. Gunesh has excellent functional, conceptual & technical knowledge coupled with very good presentation and communication skills. His domain knowledge includes wider areas like E-Security, Digital Rights Management, Telecom OSS and BSS, Mobile Computing, Workforce Management, Constraint satisfaction & Scheduling, Network Management, Image Processing and Function Point Analysis. 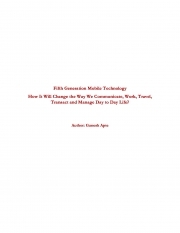 Reviews of "Fifth Generation Mobile Technology (eBook)"